The Golden Mountains of Altai is a UNESCO World Heritage Site in southern Siberia, in the Russian territory of the Altai Republic. Established in 1998, the area covers 6,222 square miles (16,115 sq km), of which 3,869 sq mi (10,020 sq km) is strictly protected and 2,353 sq mi (6095 sq km) have a lower protected status. The Altai Mountains are a mountain system of Central Asia that extends approximately 1,200 miles (2,000 km) in a southeast-northwest direction from the Gobi Desert to the West Siberian Plain, through Chinese, Mongolian, Russian, and Kazak territory, where these countries come together. The highest and most pristine areas in and around the Altai Mountains are included in the World Heritage Site designation. The Site area includes the Altai and Katun Natural Reserves, Lake Teletskoye, Mount Belukha, and the Ukok Plateau. Its wide range of physical features include approximately 1,500 glaciers, high mountain peaks as well as lower slopes and foothills and deep mountain valleys. There are numerous lakes, waterfalls, and rivers and their tributaries. There is incredible floral diversity comprising more than 2,000 species. Mammals, birds, reptiles, amphibians, and fish species are plentiful. The area is largely uninhabited with only a few small settlements mostly being used as seasonal settlements by herders. As stated in the UNESCO description of the site, "the region represents the most complete sequence of altitudinal vegetation zones in central Siberia, from steppe, forest-steppe, mixed forest, subalpine vegetation to alpine vegetation." UNESCO also cited Russian Altai's importance for preservation of globally endangered mammals, such as the snow leopard and the Altai argali, the world's largest breed of wild sheep. The Altai State Nature Reserve was established in 1932, in order to protect the taiga and highland tundra. The 3,335 square mile (8639 sq km) reserve is located in the upper reaches and right bank of the Tchulyshman River and the Teletskoye Lake. While its location near the center of Asia is generally a temperate-continental climate, there is a variety of climatic conditions over this vast area. The reserve contains 1,190 lakes having an area of over 2.5 acres each. The lakes' depth is considerable at 115-165 feet (35-50 m). The main reservoir of the Reserve, Teletskoye Lake, is the largest and considered the most beautiful lake of Altai. Four vertical zones exist in the Reserve—steppe, forest, sub-Alpine, and Alpine. In these zones are 1,270 plant species, 73 mammal species, about 300 bird species, 10 species of amphibians and reptiles. The most common animals are the maral, elk, brown bear, musk-deer, sable, glutton, lynx, squirrel, chipmunk, snow leopard. Among birds are the wood-grouse, hazel-grouse, eagle-owl, willow grouse and ptarmigan, redstart and others. There are 13 fish species in Lake Teletskoye. Grayling is found in majority of the rivers. Lake Teletskoye, literally "Golden Lake," is the largest lake in the Altai Mountains and within the Altai Republic and is contained within the Altai State Nature Reserve. It is one of 25 deepest lakes in the world, having a depth of up to 1066 feet (325 meters). It is the second deepest freshwater reservoir in Siberia after Lake Baikal. Situated at a height of 1,424 feet (434 m) above sea level, the lake is 48 miles (78 km) long and three miles (five km) wide and lies between the mountain ridges Korbu and Al-tyntu, on the junction of Sailughem Mountains and Western Sayans. Its surface area is 90 square miles (233 sq km); however, due to its considerable depth (1,066 ft-325 m), the lake contains no less than 39 cubic kilometers of water of fresh water. Annual water level fluctuations are estimated at some 348 sm. The lake is exceptionally clear, with the visibility of the lake water ranging from six to fourteen meters. The lake is surrounded by mountains of 1,968-4,265 feet (600-1,300 m) in the northern section and about 5,578-7,874 feet (1,700-2,400 m) in the southern part. It is surrounded by mountains and dark-coniferous—mostly cedar—taiga. The endangered Snow Leopard is protected in the Golden Mountains of Altai. The Katun State Nature Preserve was established o­n July 25, 1991, for the purpose of protecting unique natural complexes in the area of Central Altai Republic. It features a wide altitudinal variation and associated ecosystems, including mountain taiga, alpine meadows, glacial zones, high mountain tundra, and steppe areas. A significant feature in this area is the extensive glaciation in the area. The lakes are not large but are quite scenic. They are situated in glacier and river valleys. There are also many mountain streams with picturesque waterfalls, as well as glaciers and precipitous rocks. Plant and animal life is varied and unique. The Preserve contains many important relic and endemic species including 700 plant species, 51 mammal species, 140 bird species, three species of reptiles and eight fish species. Among fur-bearing animals are the chipmunk, squirrel, and sable. Hoofed animals include elk, maral, and musk-deer. Siberian mountain goat, brown bear, lynx and glutton, as well as ermine, Siberian weasel, mink, and weasel are also to be found. Belukha Mountain, located in the Katun Mountains, is the highest peak of the Altai Mountains in Russia. Belukha is a twin-peaked mountain massif that rises along the border of Russia and Kazakhstan, just north of the point where these two borders meet those of China and Mongolia. There are several small glaciers on the mountain. Of the two peaks, the eastern (14,784 feet-4,506 m) is higher than the western (14,567 feet-4,440 m). Some 27 square miles (70 square km) of Belukha's surface is glacier-covered. The mountain lies in a region of year-round snow. 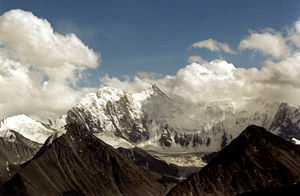 Belukha was first climbed in 1914, by the Tronov brothers. Most ascents of the eastern peak follow the same southern route as that taken in the first ascent. Though the Altai is lower in elevation than other Asian mountain groups, it is very remote, and much time and planning are required for its approach. Tapestry section, Pazyrik horseman, c. 300 B.C.E. Pazyryk carpet, fifth century B.C.E. Ukok Plateau is a remote and pristine grasslands area located in the southeastern part of the Atai Republic, on a high mountain plateau. The area is dominated by hills, steppe landscapes with marsh, streams and lakes. 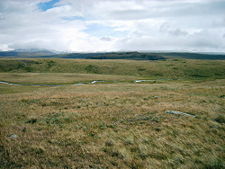 The area of the plateau that is included in the World Heritage Site is known as the Ukok Quiet Zone. There are impressive historical monuments and spectacular archaeological findings on this plateau. The most well-known are perhaps the Pazyryk tumuli, burial mounds of tribal leaders from the fifth century B.C.E. The tomb mounds are associated with the Pazyryk culture, which closely resembled that of the legendary Scythian people to the west. Of varying sizes and complexity they contain a variety of funeral artifacts and a great number of buried horses. More than 100 of these mounds have been unearthed on the Plateau, though not all within the Ukok Quiet Zone. One of the most well-known of the discoveries in the Ukok Plateau region is the "Ice Princess" excavated by Russian archaeologist, Natalia Polosmak. Three tattooed mummies (c. 300 B.C.E.) were extracted from the permafrost of the Ukok Plateau in the second half of the twentieth century. The Ice Maiden and a number of other archaeological finds were located within a disputed strip of land between Russia and China. The Ice Princess is now being stored in Novosibirsk (Russia's third largest city). The indigenous population of Altai have demanded a return of these artifacts to the Ukok, decrying the "desecration of the Altain sacred place." The Ukok Plateau is recognized as an important environmental treasure which provides a habitat for many of the world's endangered species including one of its least studied predatory animals: The snow leopard. Other endangered species protected there include the Argali mountain sheep, the steppe eagle, and the Black Stork. The snow leopard is considered an "indicator species" by scientists, meaning one by which the health of an entire environment can be determined. Because these animals are hunted for their bones and fur, as well as forced from their habitat by human population growth, they are considered endangered throughout their entire range in the high mountains of Central Eurasia. Approximately five percent of the leopard's range is protected. ↑ 1.0 1.1 United Nations Environment Programme, Protected Areas and World Heritage. Retrieved July 22, 2008. ↑ Pacific Environment, Greater Altai—Altai Krai, Republic of Altai, Tyva (Tuva), and Novosibirsk. Retrieved July 21, 2008. ↑ 3.0 3.1 3.2 Altai Republic, Altai Reserve. Retrieved July 21, 2008. ↑ Encyclopedia Britannica Online, Mount Belukha. Retrieved July 21, 2008. ↑ Paul G. Bahn The Atlas of World Geology (New York: Checkmark Books, 2000, ISBN 0816040516). ↑ PBS—NOVA, Ice Mummies: Siberian Ice Maiden. Retrieved July 21, 2008. ↑ Novosibirsk State University, Collections. Retrieved July 21, 2008. ↑ Pravda, Minor nationality of Russia demands the return of "Princess of Ukok." Retrieved July 21, 2008. 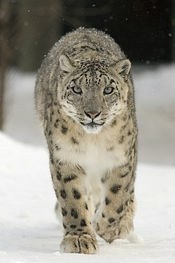 ↑ 9.0 9.1 Forests.org, Protect Snow Leopard Habitat/Siberia. Retrieved July 21, 2008. Altai Republic. Altai Reserve. Retrieved July 21, 2008. Earth Island Institute. Golden Mountains, Altai Republic, Russia. Retrieved July 21, 2008. Pacific Environment. Greater Altai – Altai Krai, Republic of Altai, Tyva (Tuva), and Novosibirsk. Retrieved July 21, 2008. Rudenko, S.I. Kul'tura naseleniia Gornogo Altaia v skifskoe vremia. 1970. ("The Population of the High Altai in Scythian Times")(Moscow and Leningrad, 1953) translated as Frozen Tombs of Siberia: The Pazyryk Burials of Iron Age Horsemen, M.W. Thompson, tr. University of California Press. ISBN 0520013956. History of "Golden Mountains of Altai"
This page was last modified on 24 June 2017, at 15:58.